A cup believed to have been used by Classical Greek statesman Pericles has been found in a pauper’s grave in north Athens, according to local reports Wednesday. After piecing it together, archaeologists were astounded to find the name “Pericles” scratched under one of its handles, alongside the names of five other men, in apparent order of seniority. Experts are “99 per cent” sure that the cup was used by the Athenian statesman, as one of the other names listed, Ariphron, is that of Pericles’ elder brother. “The name Ariphron is extremely rare,” Angelos Matthaiou, secretary of the Greek Epigraphic Society, told the newspaper. “Having it listed above that of Pericles makes us 99 per cent sure that these are the two brothers,” he said. The cup was likely used in a wine symposium when Pericles was in his twenties, and the six men who drank from it scrawled their names as a memento, Matthaiou said. “They were definitely woozy, as whoever wrote Pericles’ name made a mistake and had to correct it,” he said. The cup was then apparently gifted to another man named Drapetis (“escapee” in Greek) who was possibly a slave servant or the owner of the tavern, said archaeologist Galini Daskalaki. “This is a rare find, a genuine glimpse into a private moment,” she said. Ironically, the cup was found on Sparta street, Athens’ great rival and nemesis in the Peloponnesian War that tore apart the Greek city-states for nearly 30 years. General of Athens during the city’s Golden Age, Pericles died of the plague in 429 BC during a Spartan siege. The cup will be displayed in the autumn at the Epigraphical Museum in Athens. “Wine Cup Used by Pericles Found in Grave North of Athens.” Ekathimerini.com. Accessed 31 July 2014. A simple wineglass – a black-glazed Skyphos – 5th century BC found in a humble tomb in Kifissia comes to rock the boat of archeology, as not only it is almost certain that it was used by Pericles, but not impossible to bear and the handwritten signature. Which makes the humble vessel as the first tangible evidence of the daily life of one of the most famous personalities of history. “It is a rare find. A lively authentic element of a private moment “says archaeologist of Second Prehistoric and Classical Antiquities Serenity Daskalakis the vessel of only eight centimeters uncovered the foundations of a building under construction on the street at 18 Sparta Ave.
Just two meters below the surface and in a grave not identified bones archaeologist found the vase broken into 12 pieces. When annealed, the surprise was great. On one side below the handle was engraved six names in the genitive: Aristeidou, Diodotou, Daisimou, Arrifronos, Pericles and Efkritou. And all along was mounted on a frame. NAME-KEY. How do we know that Pericles stated in the vessel is the man who has linked his name with the creation of the Parthenon? “The name Arrifron is very rare and brought his grandfather and elder brother of Pericles. The mention of his name over that of Pericles on the surface of the vase makes us 99% confident that they are the two brothers and entered as Pericles is none other than the man who guided the fate of Athens in the period of highest edge ‘ explains the secretary of Greek Epigraphy Society and editor of archaiognostikis inspection “IOROS” (term), the anniversary edition which published the study’s important findings, Angelos P. Matthew. “It’s not the first time we have the name of Pericles in full inscription, as he is known only in fragmentary” continues stressing the importance of the find. “Assuming that the Aristides (usual name, but at the time we are talking about the famous politician lived stayed in history as Righteous), Pericles and Arrifron of skyphos identified with eminent Athenians, I see that they do not coincide in politics. Aristides acted the years 488-478 BC, Pericles the period 460-429 BC But there might be overlap in a social interaction. In 470 BC for example Arrifron would have been 25 years old, 24 and Pericles Aristides around 50, “says archaeologist, which dates the adiakosmito vessel (vessel hijacked and not of great house) using the formula of between 480 and 465 BC . The six men may be found together in a banquet or pub. And since they drank from the same vessel – something that was common – carved their names in general to show that the glass belongs to them. And periekleisan a framework to make it clear that it was nothing, starting with the largest. 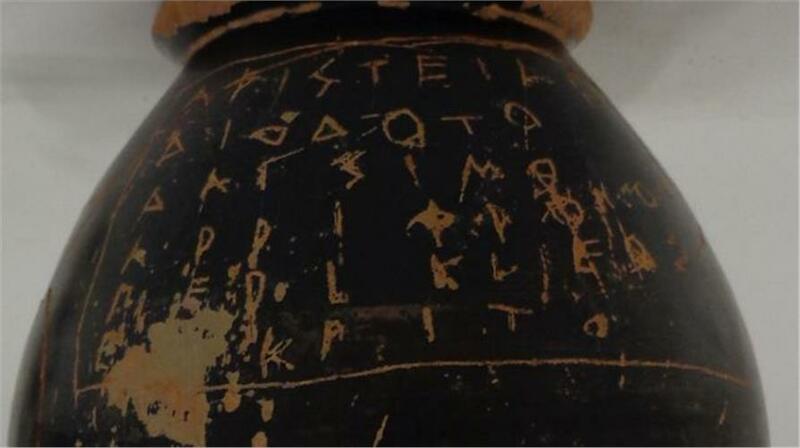 Experts distinguish at least two handwritings, but can not know whether the one hand belongs to Pericles. “It certainly was dizzy from the wine as it is clear that whoever wrote the name of Pericles made a mistake initially and wrote at par and then corrected it,” says Matthew Angel. OWNER. Whose but the vessel was found in Kifissia? The answer lies at the base of stating a name yet: Runaway, written in nominal rather than in Attic, as other names, but in the Ionic alphabet. Who could it be? “This is a main male name denoting status, brought that someone who left secretly, probably a slave” does the Serenity Daskalakis, which does not exclude the possibility that it was he who served in the banquet men or the owner of the hijacked and they gave him the vase as a keepsake. Gift precious family heirloom that was not separated nor his grave. “Βρέθηκε το κρασοπότηρο απ’ όπου έπιναν ο Περικλής και η παρέα του!” Τα Νέα Οnline. Accessed 31 July 2014. Next Post Suda On Line: Final Entry Entered! who is supposed to have done the scratching “to value add” the cup and risk losing their job and their reputation.these are not antiquities dealers trying to add $$$ on the price of the piece,these are archaeologists .surely the patina in a recent scratch would be very different from a new one added after the cup was excavated and under a microscope would stand out like a sore thumb.” why upside down,why all the names”,well why not.! lets see what develops but i believe this cup is genuine. I agree … this is still a ‘wait and see’ situation.